Real Football, or Real Soccer depending on which side of the pond you live on, is Gameloft’s answer to FIFA and Pro Evolution. The Xperia Play has been treated with this updated version of the 2011 edition of the game. So, with the 2012 version seemingly just around the corner, can this late entry to the Xperia Play line up qualify as a real contender? Well, despite it’s short life the Xperia Play already plays host to two soccer games, the excellent PES 2011 and the deeply average, but free FIFA 10. Real Football blasts FIFA 10 out of the water, but PES 2011 edges RF 2011 in terms of gameplay. The game uses the physical controls well, and passing, shooting and dribbling are all easy to perform and intuitive. You can combine buttons to execute more advanced passes such as the lofted through ball. Sprinting feels natural, as does crossing and heading, all of which makes for a very solid game of football. The problem is really the fact that turning and changing direction feels a little too stiff compared to PES 2011. Don’t get me wrong here, compared to FIFA 10, this has a much more impressive feel, but it is here that PES has that little but more quality. Where this game does trump PES is in terms of variety of game modes, with a lot of innovative modes and gameplay options available that helps to make this a real value for money buy. First and foremost, this has one feature that PES fans were so disappointed was omitted from the Android version of their game; multiplayer. Yes, two players can pick their favourite teams and duke it out of a local WiFi connection. Connecting is simplicity, and the game is smooth and lag free, as you would expect on a local connection, and I am guessing that this mode alone will sell this title to a lot of fans. There is also a whole lot of single player modes on offer. The Season Club Master is basically a manager mode, where you can buy and sell players and try to get promotion for your club over the course of several seasons, the RF League is an online-enabled mode that sees you competing against other players in a great leaderboard style league. Enter the Legend lets you play as a single player on the field and try to increase your reputation, History is a great idea that sees you placed in matches that took place in real life to see if you can beat the odds. For example you may find yourself a goal down with only a half of game time to win the World Cup Final. 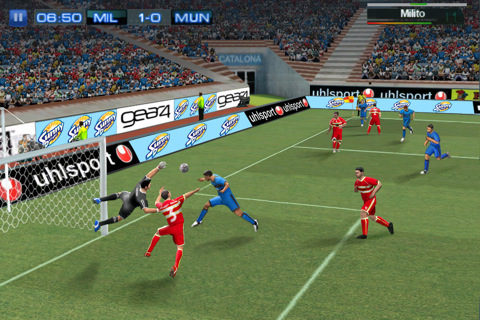 Standard Cup and League modes are here, as well as a penalty shootout game. There is an RSS feed ticker displayed in the menus showing scores from the latest games in real life, and Gameloft Live integration and a full team, player and stadium editor round out an impressive line up of content here. Overall, this a very good football game and while its gameplay may not be as smooth as PES, the multiplayer mode, wealth of single player options including a manager mode make this far better value. FIFA 12 has just been announced as an Android exclusive for the Xperia Play, so we will see if either game can stack up to that forthcoming monster, but in the meantime, if you are looking for a pure footballing game, then pick PES, but if you are after a more in-depth title that could keep you going for months, then Real Football 2011 is the game for you.